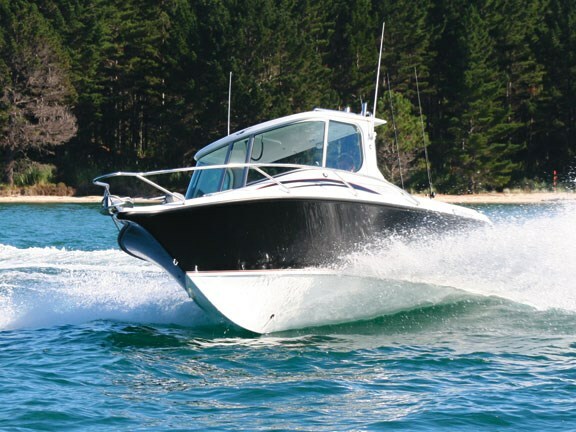 Challenger Boats’ owners, Tony and Jill Hawker, weren’t happy with the look of their established 720 S HT model so they set about redesigning the hardtop. As well as a significant change in the lines, almost half the overall weight was removed. The highly curved bow section features a solid self-tipping fairlead fed by a Quick Genius free-fall windlass. 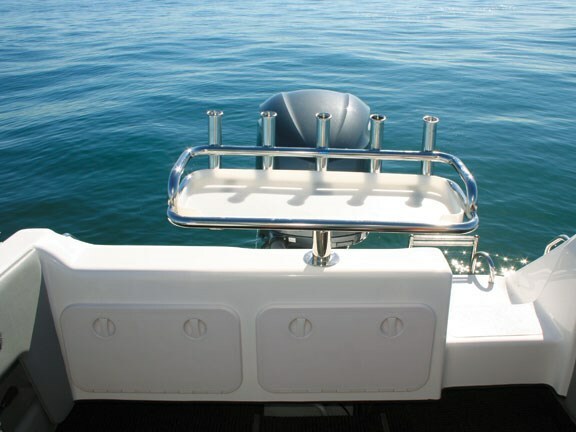 A stainless steel bow rail follows the outline of the deck and a solid rubber strip protects the entire boat. 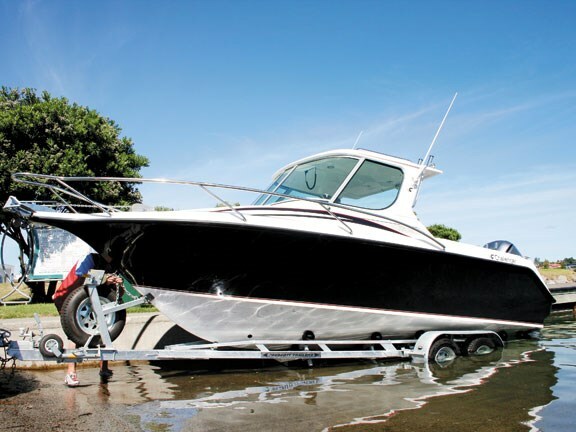 Access to the anchor well is via the front hatch or by the bow, where you will find a moulded non-skid pattern that provides reasonable grip; it unfortunately doesn’t extend to the gunnel tops. The fully lined cabin features a large upholstered V-berth, complete with an infill capable of sleeping two adults. Discretely housed beneath is an electric toilet, which still allows for generous storage in the remaining space. Hidden beneath the bunk are sealed buoyancy chambers helping this boat achieve a CPC rating. The new hardtop design features large curved polarised glass windows that provide excellent visibility and eliminate glare. Hawker has done away with the sliding windows, and the rear pillars have also been moved slightly forward, making the cabin feel more open. Additional ventilation is an option via roof-mounted hatches. 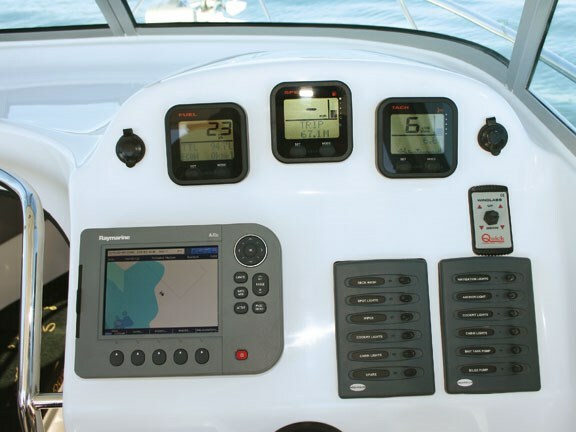 At the helm the flush mounted Raymarine A70d sounder/GPS combo takes pride of place on the dash with space to spare. Yamaha digital gauges displaying fuel usage, speed and RPM are also present. I felt the dash layout could be enhanced by shifting the windlass switch starboard of the steering wheel and moving the switch panels up in line with the GPS/Sounder. A Fusion stereo, complete with an iPod dock, cranks out great sound quality from two speakers within the built-in speaker boxes. The VHF is mounted in the hardtop within easy reach. Seating is provided via comfortable king/queen helm seats, with excellent all-round support and plenty of lift-up storage beneath. The seats have been enlarged to allow you to sit right back. The rear facing seats are just as comfortable and also allow the passengers to sit sideways. 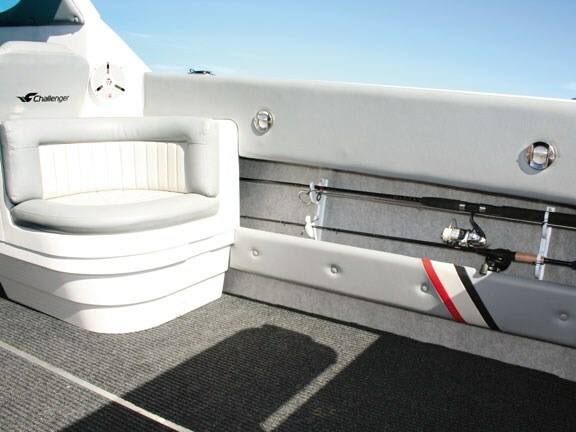 A custom-made handrail runs around the cabin entrance, and full-length stainless steel rails, complete with finger grooves, run vertically down the rear of the hardtop. LED downlights are recessed into the roof. A spotlight provides illumination for tricky knot tying and all the navigation lighting is by means of LEDs. Additional handrails run along on either side of the roof and a rocket launcher capable of stowing six rods finishes the look. The gunnels are at a good, safe height, and large parcel shelves run down either side complete with secure rod storage. The walls are carpeted and the side panels are finished in vinyl complete with LED lighting. 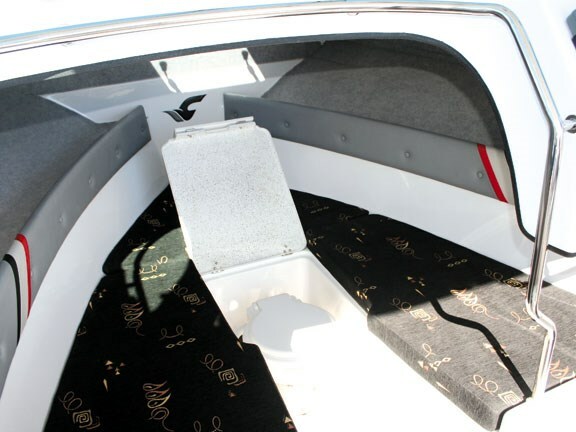 The floor is covered in ribbed marine carpet with two under-floor compartments; the front concealing the under-floor fuel tank with the rear free to be used as required. Twin plastic hatches in the transom open downwards to access the two batteries and saltwater wash-down pump. On the duckboard is the fuel filler cap, which is easy to reach from the ground for hassle-free filling. The Challenger 720 Hardtop also comes in a diesel option. 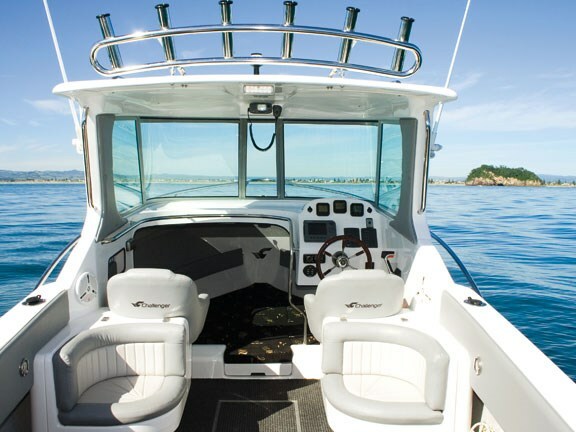 Whether you are into fishing or diving the Challenger 720 SE delivers with a roomy cockpit and an abundance of rod holders – four on the gunnels, six overhead and five on the bait board. The bait board is large and solid, although not self-draining. A live bait tank is located within the duckboard, accessed through a circular inspection port, and I’m sure a game chair could be fitted if required. There is a solid boarding ladder with handholds on the rear of the portofino stern and room for a couple of tanks in the aft under-floor compartment. Two bilge pumps are located at the back. The Challenger 720 SE comes on a Prescott tandem axle trailer complete with hydraulic brakes. At 2250kg, it does need a capable vehicle to tow it. 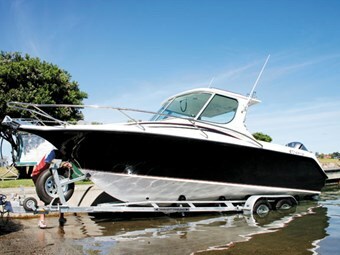 Launching is simple – it just glides off the rollers with a bit of a shove. Retrieving was a bit more strenuous, however, due to the single handled winch and substantial load. 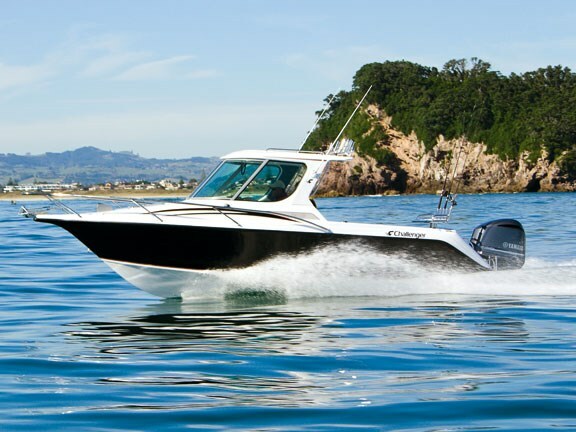 The strake-less hull design provides a quiet, soft and dry ride and at no stage of the test did the windscreen get wet or the hull bang. Turns were tight, with no evidence of side slip, even when corning hard and over the chop. The moderate 18.5-degree hull cut back through the wake with ease and transition onto the plane was smooth and barely noticeable. Although non-adjustable, I found the king/queen seating option to be at a good height with the bow fairlead still visible when seated. The helm position is also comfortable standing. 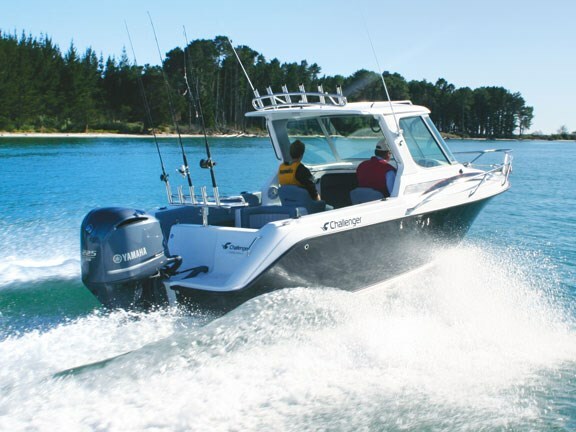 Steering was smooth, firm and responsive with the Seastar hydraulic system and coupled with the Lectrotab trim tabs, and the electronic throttle made controlling the horsepower a breeze. The 225 Yamaha four-stroke provided bucket-loads of grunt, delivering a very respectable 45mph with two people onboard. Acceleration was smooth and responsive and Hawker informs me they have got 53mph out of this boat on a different day. 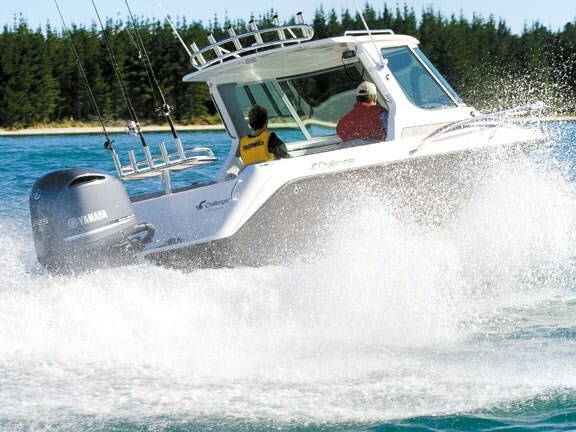 This is an outstanding boat that rides like a dream. The performance is top of its class and the comfortable accommodation is a bonus. We can say the result of the redesign is a faster and much prettier vessel. 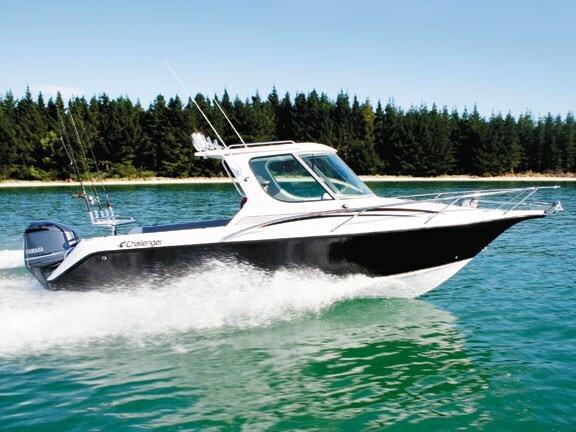 See Challenger boats for sale.